NOT ENDORSING: HMG-CN exclusively obtained documentation showing these officials did not endorse Portantino (far left) despite being listed as supporters on his website. Those not endorsing are (l-r) state Sen. Mark Leno (D-San Francisco), Glendale Councilwoman Laura Friedman, Pasadena Councilman Terry Tornek, and Eric Bauman, Chair of the L.A. Democratic Party. Thursday January 15, 1:13 p.m.
Editor’s Note: Within minutes after posting this story online, the Portantino campaign pulled the endorsement page offline. Screenshots of the entire Endorsement page, as well as a high resolution PDF, are found at the end of this article. Click here to view Google cached version of endorsement page. A Hews Media Group-Community News investigation has revealed that a website created and paid for by California 25th Senatorial District candidate and former 44th assemblyman Anthony Portantino, contains false endorsements and false statements from several high ranking California politicians, city council members, unions and other organizations. The investigation revealed that after Portantino termed out of the California Assembly in 2012, he commissioned a “webmaster” to build the site and began uploading the false endorsements, subsequently sending supporters to the site to create a “snowball” effect. A “WHOIS” search shows that the web address, va4ndor.com, is registered under an Elliot Cuite of Duarte. After a few phone calls placed by HMG-CN to officials listed on the website, it became apparent that the falsified list of endorsements and statements was staggering even to the most seasoned political veteran. 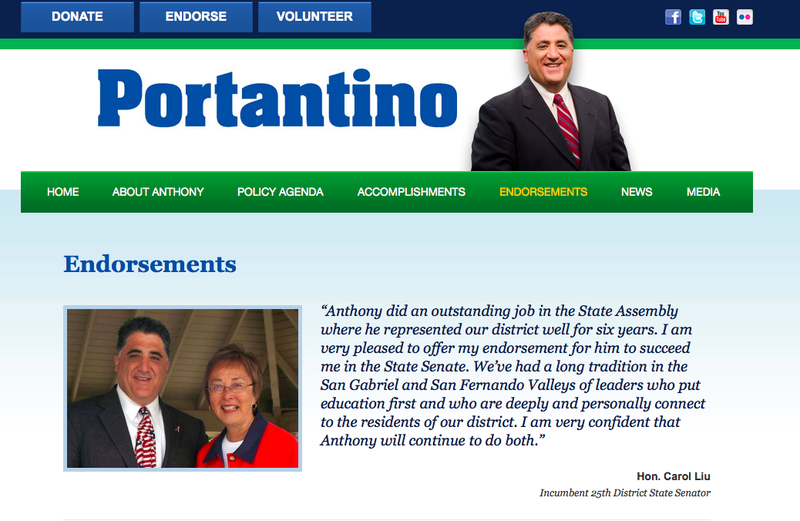 A Google search using the term “Anthony Portantino Endorsements” sends the user to the website va4ndor.com/anthony-wp/endorsements listing over fifty endorsements and statements. 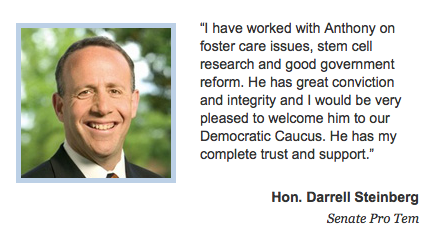 Scrolling down the endorsement page reveals the “State Senate Leaders” portion of the site. HGM-CN obtained emails and texts confirming that Sen. Leno did not endorse Portantino. 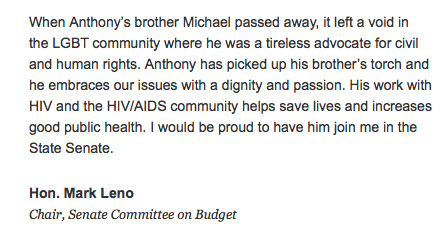 Even more deplorable, Leno indicated in those communications that he did not give Portantino the statement about his brother Michael, indicating Portantino completely fabricated the statement. Another state Senator rumored as not endorsing Portantino is Sen. Fran Pavley (D-Agoura Hills) listed as Chair of the Senate Policy Committee on Natural Resources and Water. HMG-CN was told that Assemblymember Anthony Rendon (D-Lakewood), also listed on the site, was not endorsing Portantino, but calls into Rendon’s office went unreturned. The investigation also found that two local city council members listed on the site are not endorsing Portantino, Pasadena City Councilman and candidate for Mayor, Terry Tornek, and Glendale City Councilwoman Laura Freidman. Sources tell HMG-CN that several organizations including IATSE (International Alliance of Theatrical Stage Employees) Locals 44 and 871 are not endorsing, yet listed on the website. In addition, the California Police Chiefs Association, the California Faculty Association, Crime Victims United, are also on the site but not endorsing. Leland Yee was VERY duplicitous. All the state needs is a guy duplicitous and shady enough to make up quotes about his dead brother. Sheesh. It’s a shame Kamala Harris is a Democrat too. Maybe we could see some prosecutions instead of hand slapping with little fines. But that’s O.K., We would have to release more prisoners early if we locked up all the crooked Democrats! We could use the Bullet Train money and build a new prison. We could name it “Jerry Brown Penal Asylum” Imagine how big the armored truck would have to be to deliver all the pension payments on the 1st! I notice all of these are democrats! Wow where have we heard that one before??!! The dumbo-craps and libturds seem to have a LOCK on the cheating and lying department starting in DC and then Stinkramento! All are just pieces of garbage doing what ever to retain power and feed at the public coffer trough! – After all it is the victim-crat way of life to do this crap!